The best moments in life are usually found in the un-expected. We arrived late in the evening and somehow ended up in the wrong lobby, oops! One phone call from the receptionist and a nice friendly bellman arrived to greet us and showed us our way through a serene courtyard with a soothing fountain to the discreet doors that led us into Taj 51 Buckingham Gate. We were greeted by smiles, offered a relaxing seat and refreshments while the lovely host managed our arrival. Service was friendly, welcoming and efficient. The bellmen escorted us to our room, explained in-room technology, lighting and features to us and we were on our way to pure relaxation. For those seeking refuge from the hustle and bustle of London, this hotel is a most obvious choice as it is just tucked away on a side street and only a short stroll to most major sights including Buckingham Palace, Saint James Park, Big Ben and more. It is perfect for families and people who are looking for more space and/or an option for a long term stay in London. The children felt at home at Taj 51 with bathrobes, slippers, teddy bear and sacks filled with fun activities. 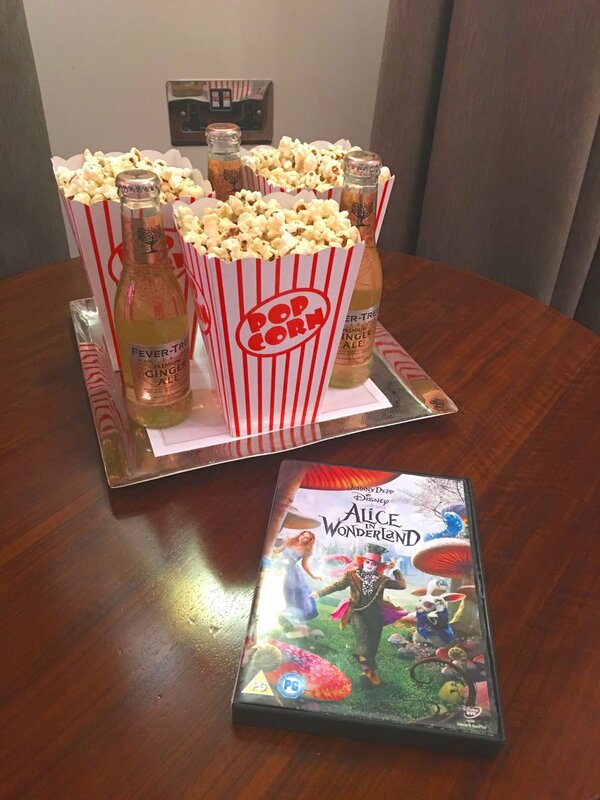 The best was yet to come, magic was made when we stayed in the night of our arrival and watched Alice n Wonderland… the hotel prepared a nice Family Movie Night experience… look how cute! More magic was found the very next day after a full day of exploring and witnessing the changing of the guards, we returned to the hotel for an Alice n Wonderland themed high tea experience. It was my children’s very first high tea experience and they couldn’t believe their eyes from the large cards, mad hatter hat to the eclectic display of themed treats: Queen of Hearts Mango Tarts, Drink Me Strawberry potion to pocket watch macaroons, it was so very whimsical! The look on their faces tells it all! A warm thank you to the team at the Taj 51 Buckingham Gate for welcoming us on this holiday stay at the property. A Most Memorable Stay at the Langham in London!